I'm thinking about writing a script for Pierce Brosnan. While I am by no means the first to point out Bron-homme's fondness for scripts that take place overseas, irrespective of their merits outside of that, The Love Punch is what I imagine would happen if someone were given the unenviable task of creating a story for Wish You Were Here... The Movie. It needn't have been so, either. With a timely plot in which an unscrupulous hedge fund manager leaves a few hundred employees without jobs or pensions, this should have been a bit more fun. Bron-homme plays Richard, a character who's divorced from Emma Thompson's Kate. When Richard's job is pulled out from underneath him, the two of them stop squabbling and decide to take what they're owed, with an elaborate, globe-trotting plot to rob the man who stole their retirement on his wedding day. There's not a whole lot to say about this one. Some have called it a harmless, Sunday afternoon sort of movie, a phrase which is usually used to put down better films than this, and given how I happened to see it on a Sunday afternoon, I can't find any quarrel with that summary. There are a couple of chuckles here and there, and it's all pretty harmless, but if it's such an easy-going film, then why does it feel like they've missed an opportunity here. 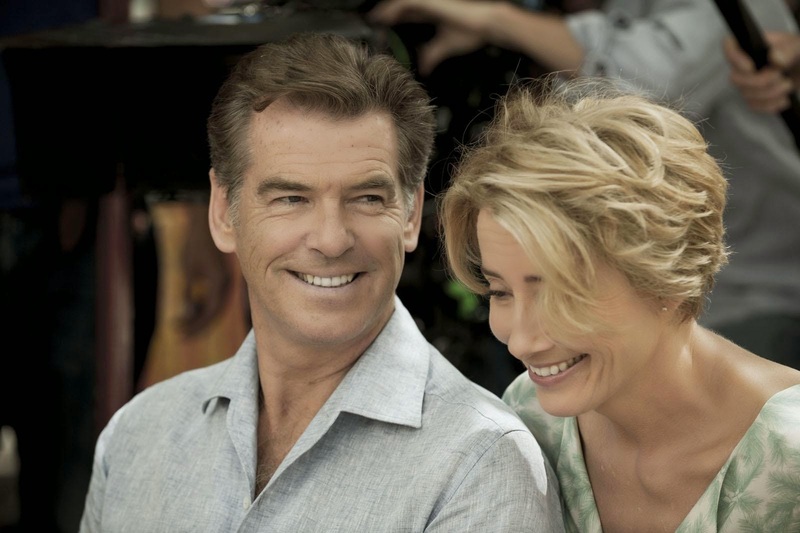 Apparently, the film came about from Thompson and writer-director Joel Hopkins being mutually amused by the idea of her being paired with Brosnan in a movie, and there are definitely glimmers of how well that could have turned out. I've said for a while now that there aren't enough romantic comedies that even try to replicate the tempo of films like His Girl Friday, and the genre probably went into sappy decline once people started speaking more slowly. Sure enough, Brosnan and Thompson have the kind of Spencer Tracy-Katharine Hepburn chemistry that's seldom seen nowadays, but they only have it for moments at a time. 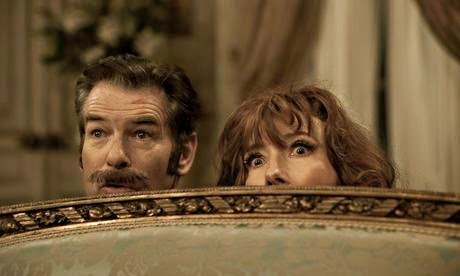 While we feel used to seeing Brosnan gurn through films like this since he hung up 007's tux, I think we all hope for better from the usually marvellous Emma Thompson. The travelogue feel of the movie comes out of its flighty plot, driven more by slapstick setpieces than any sympathy for their plight, no matter how appalled they may be that nasty bankers have taken the money for which they worked so hard. And so, the conceit is more concentrated on the idea of two couples from the Home Counties- Brosnan and Thompson are joined by Timothy Spall and Celia Imrie as their neighbours- plotting a heist. Hopkins seems to realise how ridiculous that is, but doesn't know what to do with it, and the very talented cast are caught out mugging as a result. By vast contrast, the comic highlight of the film is the masterfully absurd pay-off to a running gag about Richard and Kate's allergies and phobias, which was the only point in the film that made me laugh out loud. While The Love Punch is obviously pitched into the "grey pound" market that has proven so profitable for goodies-but-oldies such as The Best Exotic Marigold Hotel and Quartet, there's an implicit disdain for itself- a disdain which Emma Thompson had to go and say out loud while promoting the film. While it stops short of full-on "hurh hurh, old people are old" jokes, I would probably have screamed if director Joel Hopkins had squeezed in even one more slowed-down or sped-up shot of our protagonists doing the stuff that is normally reserved for younger leads. It's harmless, but that's the most disappointing thing about it. The Love Punch is still showing in cinemas nationwide. If you've seen The Love Punch, why not share your comments below? Pitches for Pierce Brosnan movies are also very welcome- if we can find an opportunity for him to run in a movie again, that'd be ideal.